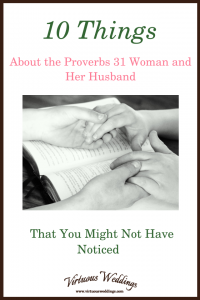 Do you strive to be a Proverbs 31 Woman? 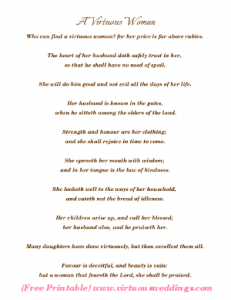 Here’s another Proverbs 31 free printable (with selected verses from Proverbs 31:10-31) for your wall or planning notebook. 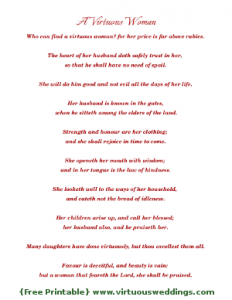 Do you aspire to be “A Virtuous Woman” in the manner of the woman in Proverbs 31:10-31? Use this free printable to inspire you and remind you of what that means! 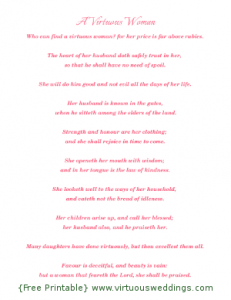 Here’s a pink version of the brown Proverbs 31 printable I posted a couple of weeks ago. 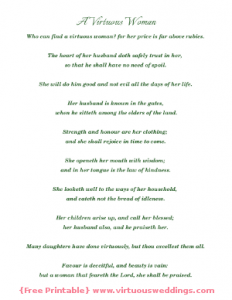 The Proverbs 31 Woman stands as an inspiration to so many of us. 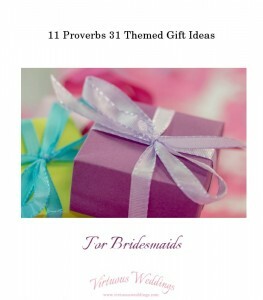 Why not put a pretty copy of some of her attributes in your wedding planning notebook or personal planner?